Happy Thursday, everybody! 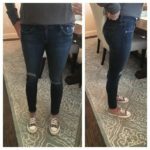 I know I don’t normally have a Thursday post, but my April is full of some amazing posts, and I really wanted to find a place to do a jean comparison for y’all. So, today is the day! 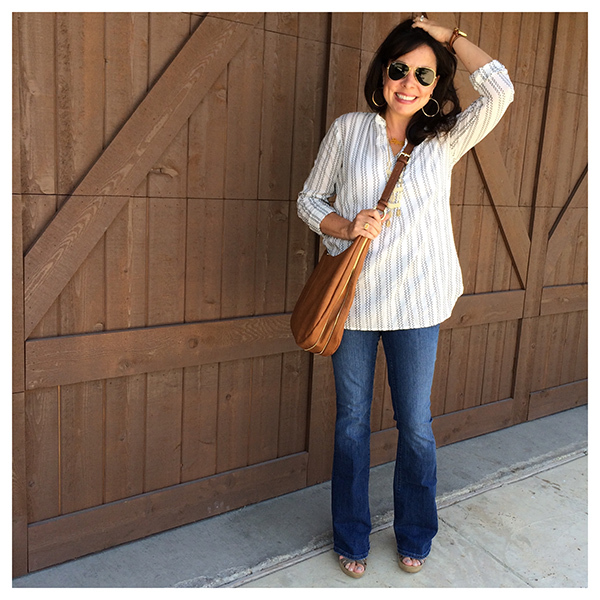 Do you remember this pair of button fly jeans from last Friday’s post? Man, they took us all back! Many of us had flashbacks to our favorite pair of jeans in junior high. I’m pretty sure mine were GUESS. If you’re like me, you wouldn’t have necessarily thought you would ever be wearing this style again. But here I am. Wearing them AND LOVING THEM. They don’t sag at all and they are a higher rise (but not too high). I feel like although they are a throwback, the button fly actually makes them cool and modern! There is no distressing, and the raw hem is subtle. I’m wearing my regular size 4s, so I think they are true to size. 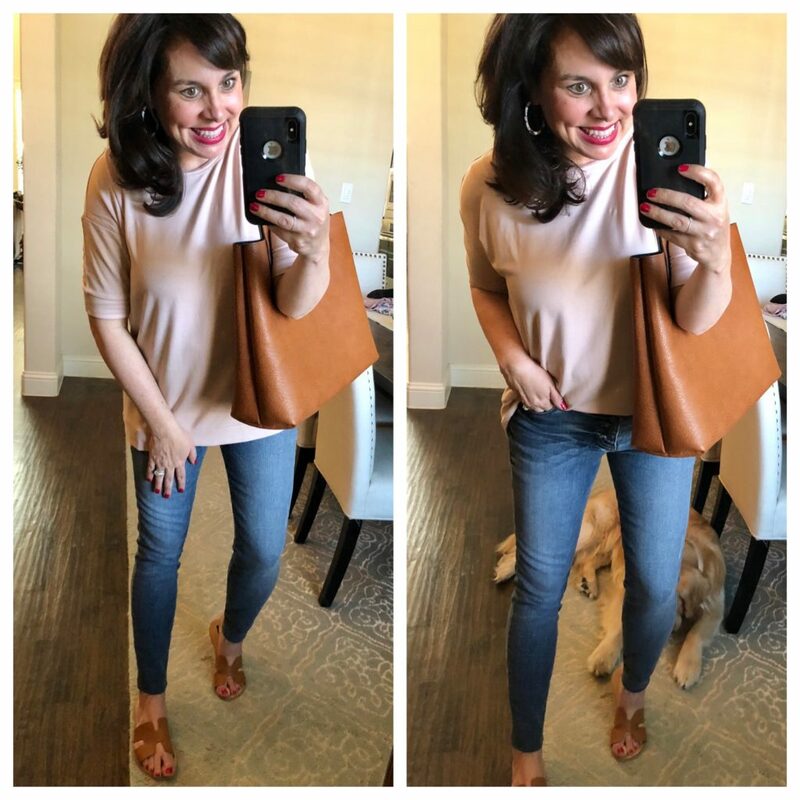 I wore them several times last week and thought they looked great with this other soft tunic tee. 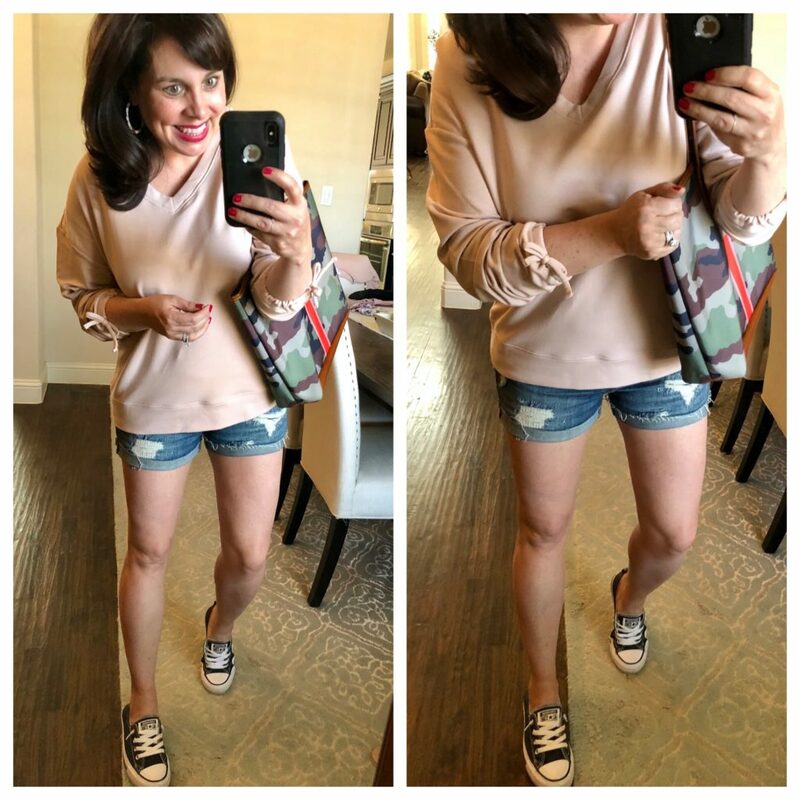 This top is officially called a sweatshirt on the site, but I think it’s more like a luxe jersey tee. It is incredibly soft. It’s cut generously, but it drapes very nicely and feels awesome against the skin. There is absolutely nothing ground breaking about this top, but you will want to wear it all the time. I like how the sleeves are a bit longer than a typical short sleeve, and I know there are many of you out there love a little extra arm coverage. I’m wearing a small, and it’s roomy, but I wouldn’t want to size down. Here’s a close up of the jeans again! 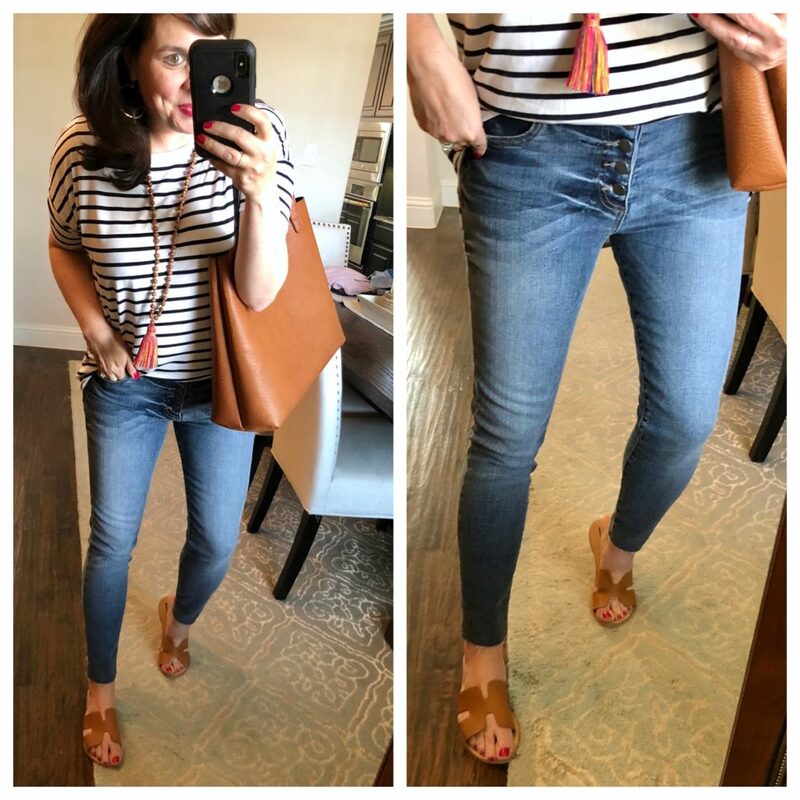 As a Kut from the Kloth brand ambassador, I’ve tried a new pair of jeans for the last 5 weeks, including these boyfriend jeans (see them on me and read my thoughts about them HERE) and this white pair (see them on me and read my thoughts about them HERE). I really liked both of them a lot. All 5 pairs I’ve tried have fit me awesome and been true to size. But the jeans below are my top 3 favorites so far. I’ve had some questions about which pair I like the best (please don’t make me choose! ), so I thought I would do a quick little side by side comparison for y’all! They are super stretchy (but they don’t sag! ), very comfy, really soft, and sooooooooooooooooo flattering. They hug me in all the right places and just make me feel great. I love the darker wash, the slight whiskering, and the ankle length. The hem on these is finished, so if you don’t like a raw hem, these are for you! These are the darkest wash of all 3 pair. And they are the softest and most stretchy of all three. For size reference, I’m wearing a 4, so I think they’re true to size. Click HERE if you want to see them styled in several different outfits. They’re perfectly stretchy, incredibly comfortable, and very slimming. They have a great raw hem, and I think the higher waist makes them feel totally chic. I will wear them with Converse, with sneakers, with sandals, and with wedges. In the colder months they’ll be awesome with booties and tall boots. I’m a big ol’ fan. They would look great dressed up with heels for a night out as well! They are true to size, I’m wearing a 4. These were definitely the biggest surprise for me. As mentioned previously in today’s post…They don’t sag at all and they are a higher rise (but not too high). I feel like although they are a throwback, the button fly actually makes them cool and modern! There is no distressing, and the raw hem is subtle. I’m wearing my regular size 4s, so I think they are true to size. I truly can’t pick a favorite, and I am having so much fun rotating through them! 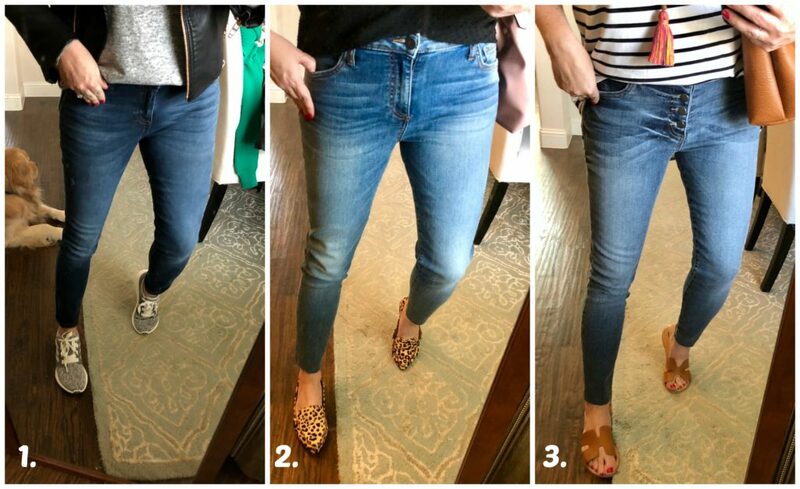 If you’ve purchased one of the pairs of jeans I’ve recommended, please leave a comment with your thoughts! I’ve already received tons of amazing feedback from readers, so I thought I would share just a handful of messages today! It absolutely tickles me that y’all are loving the jeans just as much as I do! They really are great jeans that are very well made and look more expensive than they are. I’m so proud to be a brand ambassador! And just because, I thought I’d share a couple of more outfit pics that didn’t make it to my Amazon post last Friday. Go check it out now, if you haven’t read it yet! I feature a darling red flutter sleeve dress for $22! And a long black maxi that feels like buttah for only $25! 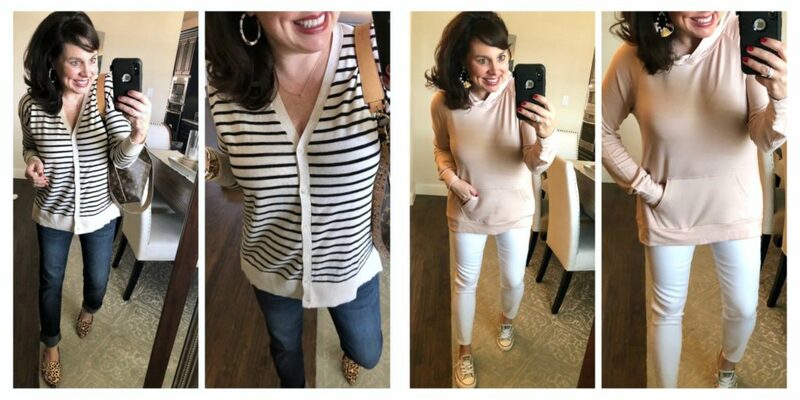 Here I’ve paired the super soft cardi (I’m wearing a small) from last month with the super soft tunic tee from this month! It’s cute worn with both the frayed cut offs and the button fly jeans. And just one more Amazon item that didn’t make it to last week’s post. I am absolutely loving this sweatshirt with the tie sleeves. It’s cozy AND it’s cute with the fun little tie detail at the sleeve. For size reference, I’m wearing a small. That’s it y’all! See you back here tomorrow for a BEAUTY POST!!! I’m going to be sharing some tried and true favorites that I’ve been using for several years, and I’m also going to be highlighting some new items I’ve added into my routine that have given me great results! Those button fly skinny jeans are SO CUTE!! OMG! I’m Jennifer from above! Why do I feel like a celebrity now? Hahaha! I got #2 and #3, and I kept both. And I did it up ordering the denim jacket too. It gets here today!!!!!!!!!!! Of your top 3 pair, I’ve ordered the first two. I’ve already worn the high water with the raw hem and love them. I couldn’t decide if I needed both pair but the I really like the dark wash of the others and they are so, so soft. I’m teying to decide if I should just wear them or if I should order the button up ones and try them. Thank you so much for your blog, I love it and my wardrobe has completely changed because of you! Okay, I LOVE the 2nd pair, and all three look fabulous! 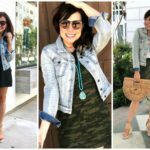 I’ve been a denim jacket lover since last year (don’t know what took me so long to try), but you were 100% right. It’s the most worn item in my closet. I bought jeans #2 a couple of weeks ago at your recommendation and I love them so much. I’ve never had higher waisted jeans or kut from the kloth jeans, and I think they’re awesome. No wonder you can’t choose a fave! They’re all so cute! These jeans are all so cute! I’m loving all your Amazon finds as well. Happy Thursday! 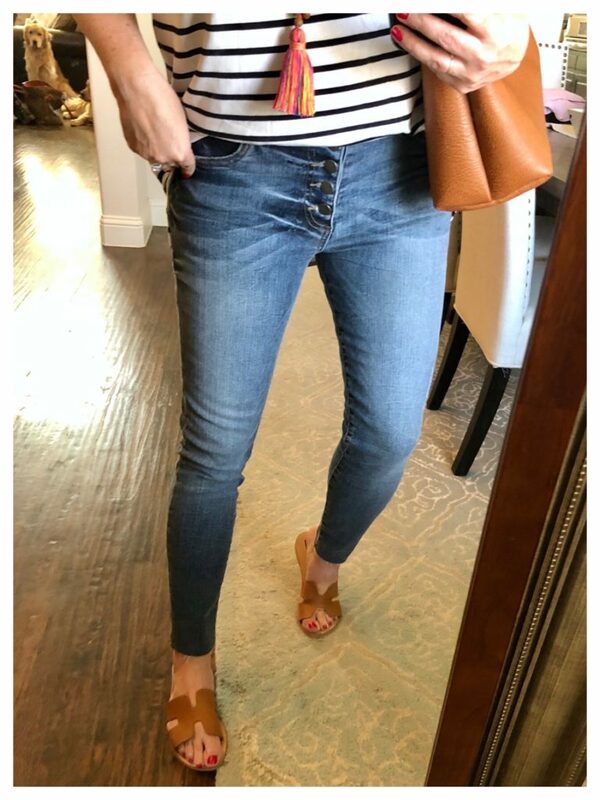 I ordered the button fly jeans and I have to say they are sooo comfy but I have to note they do have one kinda weird distressing that I thought was a flaw until I looked closer at the Nordstrom site its just a line down the right leg. I don’t see it in your pictures but it might be slighter than on mine. Not enough for me to return them but something to note. I haven’t noticed this, Kim! I’ll have to check it out! Loft had a pair of button fly jeans last year with a rough hem. I bought them and they are my favorite jeans. I feel like they are so slimming! Say, I was in Nordy’s yesterday and saw the jeans. I was on my lunch hour so I didn’t have time to try them on, but I DID see a raw hem denim jacket from Kut from the Kloth on the store display that you may need to try on and give us your thoughts. It was super soft and very unique!! Thank you!! How do the Kut jeans compare to Wit & Wisdom Absolution in terms of support over the belly (without being uncomfortable) and overall stretch? I have pretty much changed my whole closet to W&W based on your recos! Thanks for this! I am pregnant again now so will need that belly support but stretch for a bit this year. I’ll have to try Kut again once I’m back in shape! I got the Kut donna ankle jean when you first previewed them. I loved them so much at first. I am now on my 4th wearing and will have to wash and hopefully they will return to the original shape.. These are the first jeans in a ling time that have become baggy with wearing. I am 5’3 size 4, my normal size inall other brands.